On Sunday, May 7th, Ashley hits the road to Asheville to cook a special dinner with one of our favorite people, chef Elliott Moss, and his team at Buxton Hall BBQ. 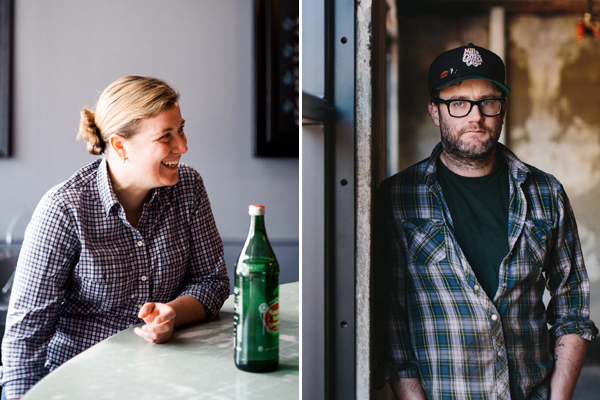 Ashley and Elliott will be collaborating on a menu that features dishes from both of their cookbooks, Poole’s: Recipes & Stories from a Modern Diner, and Buxton Hall Barbecue’s Book of Smoke. Get your tickets here. Looking to make Ashley's signature fried chicken recipe at home? Look no further. 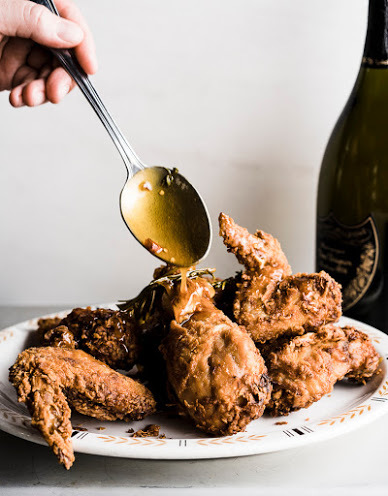 This recipe, from Ashley's cookbook Poole's: Recipes and Stories from a Modern Diner, is inspired by the fried chicken her mother used to make when she was a child. The somewhat unconventional move of drizzling honey over the chicken came about because of her dad, who was a hobbyist beekeeper and gardener. Combine 6 tablespoons salt, the sugar, and 4 cups water in a large pot and stir until the salt and sugar dissolve. Add 4 more cups cold water. Add the chicken pieces. Cover and refrigerate for 8 to 12 hours. 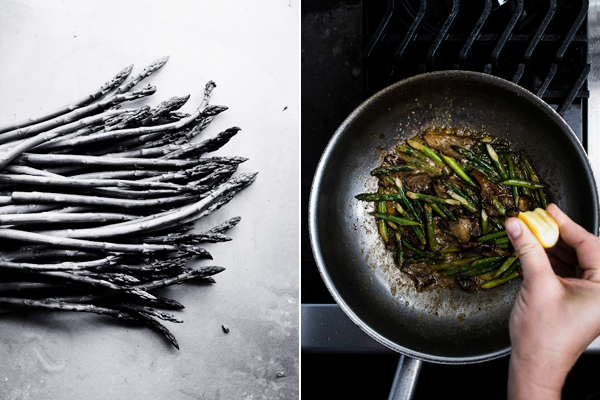 Remove the chicken from the brine, discard the brine, and pat the chicken pieces dry. When you’re ready to fry the chicken, pour enough oil into a large cast-iron skillet to come halfway up the sides and heat until it reaches 325°F on a deep-fry thermometer. Meanwhile, put the flour and 1 teaspoon salt in a paper grocery bag, fold closed, and shake to combine. Fill a large bowl with the buttermilk. Line a baking sheet with paper towels. Lift the chicken pieces from the bag and shake off the excess flour. Add the pieces to the skillet, making sure not to crowd the pan and adjusting the heat of the oil as necessary to maintain 325°F. Fry the pieces, turning once, until done (155°F on the interior for white meat, 165°F on the interior for dark meat); this will take about 9 minutes for wings and drumsticks, 11 to 12 minutes for thighs and breasts. Transfer the chicken to the lined baking sheet and let rest for at least 10 minutes. While the chicken rests, make the hot honey. Warm the honey, garlic, thyme, rosemary, and chiles in a small saucepan over low heat for 5 min­utes; the honey will begin to foam slightly. Remove from the heat and add the butter, gently swirling until it’s completely melted. The clock is ticking and there are only a few more chances left to get your copy of the Poole's cookbook signed by chef Ashley Christensen. Please join us at one of the following local book signings. December 10, 10 am to 2pm: Bridge Club Holiday Market, Bridge Club, Raleigh Join us at Bridge Club, AC Restaurants' private events space, for a special Holiday Market featuring some of our favorite local vendors. Chef Ashley Christensen and our executive pastry chef, Andrew Ullom, will each be giving cooking demos, and we’ll be selling signed copies of the Poole’s cookbook, as well as gift certificates to all the AC Restaurants properties. Come grab a mimosa and get your holiday shopping done! Participating vendors include: HAAND Ceramics, Peppertrain Beads, Farmer's Daughter, Videri Chocolate, o2 Fitness, and Short Stack Editions. Free to attend, RSVP here. December 11, 2pm: Book signing with Short Stack Editions, Quail Ridge Books, Raleigh Get your copy of the Poole's cookbook signed by Ashley at this meet and greet event. Free to attend. December 13, 5 to 7:30 pm: Book signing at Poole's Diner, Raleigh In honor of the Poole's 9-year anniversary, we'll be tipping back some champagne and signing some books at the counter where it all began. 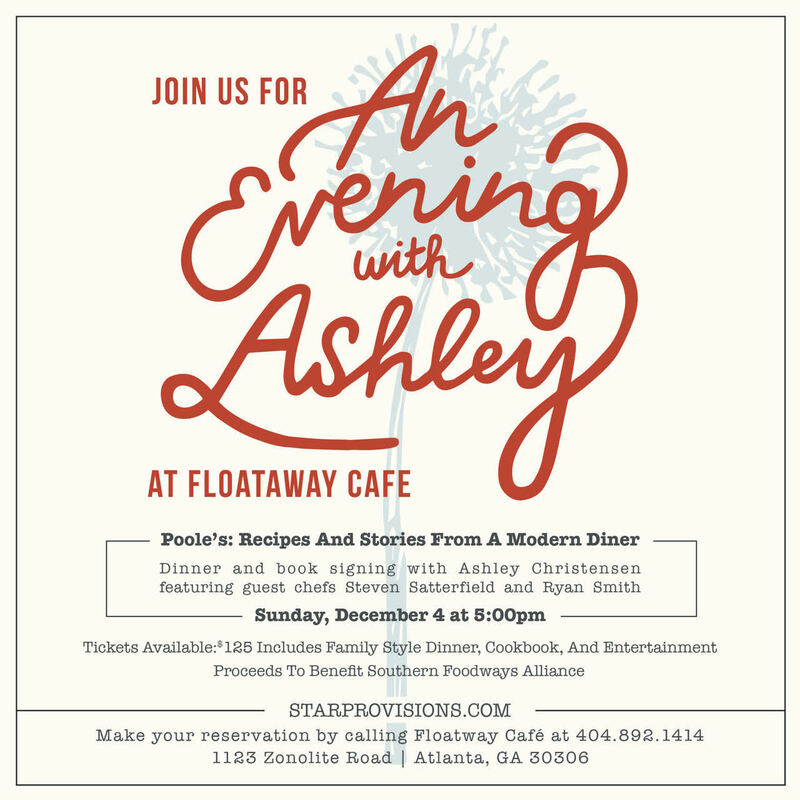 December 17, 2 to 3:30pm: Book signing, Page 158, Wake Forest Get your copy of the Poole's cookbook signed by Ashley at this meet and greet event. Free to attend. 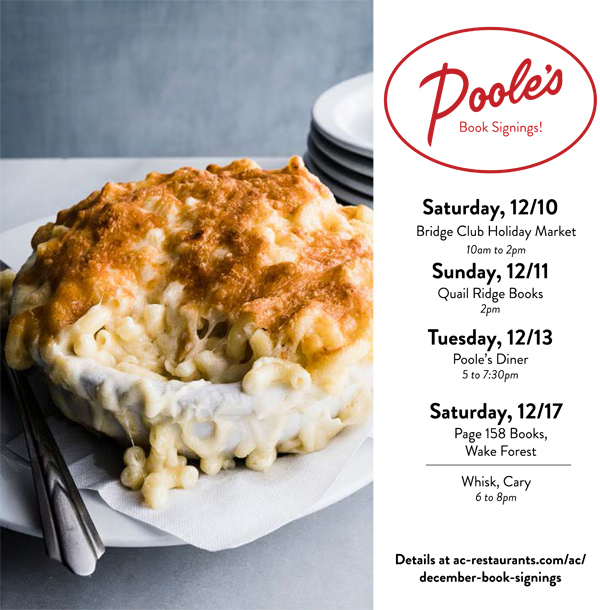 December 17, 6 to 8pm: Book signing, Whisk, Cary Get your copy of the Poole's cookbook signed by Ashley at this meet and greet event. Free to attend. We're so excited to be teaming up with a dream team of Atlanta chefs and friends in support of the Southern Foodways Alliance. We hope to see you there!